If you’re a parent of a new baby, you’re probably tired! Most new babies wake up frequently. Tiny tummies fill up and empty quickly, and babies seek comfort as they adjust from womb to world. Child development experts tend to agree that for the first 4-6 months, it’s best to wake up with your baby at night to ensure that she is fed and comforted. The good news is that if your baby is healthy and your pediatrician gives you the okay to stop feeding her at night, you can consider sleep training. Sleep training is a wide range of methods aimed at teaching your baby to fall asleep on her own at bedtime and when she wakes in the night. Before starting, see our article on creating good sleep habits, which are a common thread in all of the approaches below. To decide which method to try, think about your baby’s personality, and yours. Consider how different approaches might affect other family members, like older siblings. If you share caregiving with anyone else, talk to that person about what would work for both of you. The dynamics of every household are different, so choosing how to sleep-train your baby will be a personal decision based on what feels right for your family. While there are many sleep training methods, most of them fall into one of the categories below. Cry It Out (CIO) involves allowing your baby to cry when you put her to bed or when she wakes in the night. Supporters say it works quickly to teach babies how to self-soothe and fall asleep without needing you to intervene. CIO might be a good fit if your baby is generally easy-going, or if sleep deprivation is negatively affecting your functioning. 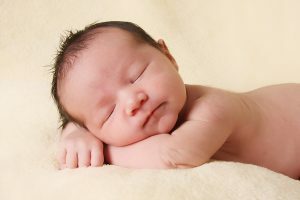 Two popular proponents of CIO are Dr. Richard Ferber, author of “Solve Your Child’s Sleep”, and Dr. Marc Weissbluth, author of “Healthy Sleep Habits, Happy Child.” Ferber developed a method that guides you to respond briefly to your baby’s cries (without picking her up) at increasingly longer intervals until she falls asleep. Weissbluth advocates for a stricter CIO method involving less parental intervention. No-Cry methods encourage parents to use gentle approaches to help baby sleep, and say it’s okay to respond to babies by picking up, holding, rocking or feeding them when they wake in the night. Supporters say it promotes bonding, baby’s emotional development, and a positive association with sleep. This might be a good fit if you don’t mind waking up in the night with your baby, or you want to try the most gentle approach first. Elizabeth Pantley, a parent educator and author of “The No-Cry Sleep Solution”, is a well-known proponent of no-cry methods. Pantley offers tips for gradually teaching your baby to self-soothe without allowing her to cry, like rocking her until she’s very drowsy but not fully asleep before putting her in her crib. “In-Between” methods are a middle ground between CIO and no-cry approaches. Parents intervene in limited, systematic ways to help baby fall asleep. Supporters of this approach say it teaches independent sleep with very little crying. This might be a good fit if you prefer a middle-ground approach and are willing to put in some time, effort, and patience to follow the method you choose. Kim West, a licensed clinical social worker and author of “Good Night, Sleep Tight”, suggests sitting next to your baby’s crib for a few nights, where you can offer a pat or reassuring word if she becomes upset. Every few nights, she says, move further from the crib ­to the other side of the room, then the doorway, then the hall, and so on, until your baby can fall asleep without you in the room. Tracy Hogg, nurse and author of “The Baby Whisperer” books, developed the Pick Up/Put Down method: Pick up your baby from her crib when she cries, then put her down as soon as she is calm, and repeat this until she is asleep. No matter how you choose to sleep-train your baby, one of the most important things to remember is this: Research shows that all of these methods are effective if followed consistently. Choose one that feels right for you, and stay the course. Before long you should be seeing zzzs!